Miqra `al pi ha-Mesorah is a new experimental edition of the Tanakh in digital online format, now available as a carefully corrected draft of the entire Tanakh.The first complete draft was finished on erev Shabbat Parashat Ki Teze, 10 Elul 5773; August 16, 2013. It is based on the Aleppo Codex and related manuscripts, and consults the full range of masoretic scholarship. Two features make this edition of the Tanakh unique: Full editorial documentation and a free content license. 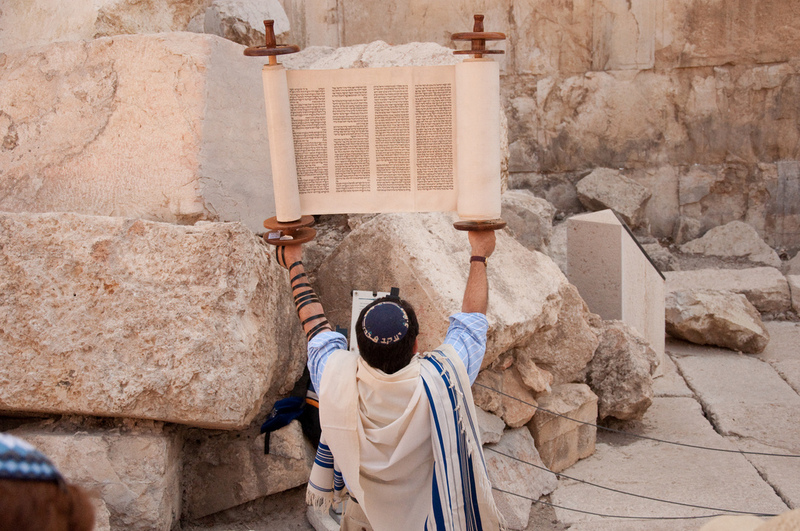 Full editorial documentation: Various editions of the Torah or Tanakh in Hebrew may seem identical to the untrained eye, but the truth is that each and every edition—from Koren to Breuer and from Artscroll to JPS—makes numerous important editorial decisions. In most editions these decisions are not transparent, and the student of Torah therefore relies upon the good judgment of the editor. But in Miqra `al pi ha-Mesorah the entire editorial process and the reasoning behind it are fully described in all of their details: Every stylistic alteration and every textual decision made regarding every letter, niqqud, and ta`am in the entire Tanakh is documented. An extensive, six-chapter methodological introduction describing the editorial process in great detail is available here (in Hebrew).The basic method for establishing textual details in this edition is similar to that of Mordechai Breuer and Miqra’ot Gedolot Haketer, both of which are extremely similar to each other: Despite the impression one can get from reading the literature about them, the differences between them are nearly insignificant compared to their similarities. Both of them largely conform to the original conclusions of Israel Yeivin regarding the reconstruction of the Aleppo Codex in its missing parts for niqqud and te`amim, and to the conclusions of Breuer himself for the letters. This new edition differs from both Breuer and MGH significantly more than they differ from each other. All of the editing has been done from scratch according to methodological details that are explained in the extensive introduction. The most visibly unique feature of this edition is in its formatting, which will be described briefly below. Free Content License: Unlike most other modern editions of the Tanakh, Miqra `al pi ha-Mesorah is made available under a free and open license for public use (CC-BY-SA). This license covers both the text itself and its extensive documentation. The first is Mechon Mamre, which is a very good, accurate online version of the Tanakh according to the mesorah (approximating the Breuer methodology). But it lacks documentation, and it is not available under a free license: You can make limited private use of it without asking for permission and paying a fee, but you cannot reproduce it or improve it (e.g. by posting it on your website together with a translation, commentary, or any other added feature). The second is the Westminster Leningrad Codex (WLC), a professional academic edition whose creators have graciously made it available with no restrictions. But its text is not entirely appropriate for Jewish use. The WLC is an attempt to create an exact digital representation of one extremely important manuscript, called the Leningrad Codex, but includes all of its thousands of idiosyncrasies and blatant errors. The practical purpose of the WLC is to provide a justifiable base text for bible translators, linguistic analysis, and other technical academic goals, and for that the Leningrad Codex is sufficient. But it is insufficient for Jews who want to study, read or chant the Torah and the Tanakh according to their niqqud and te`amim.An added indication of its practical purpose is the fact that the WLC omits basic elements of the Leningrad Codex when they are irrelevant to Christian translators and scholars, such as the division of the Torah into weekly readings, and of the Tanakh into sedarim. The parashah divisions (open and closed) are not represented visually, and the “song” formatting is not represented at all. These are all basic elements of the Leningrad Codex, and of the traditional Jewish division of the Tanakh for public reading, but they are not reproduced in the WLC. The chapter divisions are added instead. The most visibly unique element of this new edition is that it has been formatted as a Tiqqun Qorim, by providing helpful features to the reader that are not always present in the manuscripts and older editions. For instance, when the final syllable of a word is not stressed, an extra ta`am has been added consistently in the proper place (pashta, zarqa, segol, telisha). Legarmeih and paseq are distinguished.Implementation is still in progress on this feature. Qamaz qatan has been added in full (alternatives are documented where traditions differ about its application). These and many other stylistic features are described in chapter two of the introduction (in Hebrew). The parashah divisions (parashah petuhah and parashah setumah) are indicated visually (not with the letters פ and ס), in way that maximizes their impact on a computer screen or in print, and is consistent with their use in the Aleppo Codex and by the Rambam. Sifrei Emet (the three poetic books Psalms, Proverbs, and Job) appear in an entirely new format (see the full text of Proverbs here for example).The new format for Sifrei Emet and the reasoning behind it are discussed in detail here. Many more features can be added to the text in the future. Some volunteer programmers are already working on it offsite. Other volunteers who want to suggest corrections, add new features, or help improve this edition in any other way are welcome to make contact. Those who want to create derivative versions of it with special capabilities are also entirely welcome. The only condition is that they make their own work freely available to others under the same open terms as the work they used. Some features of this edition are still under construction and not fully implemented (the most obvious being the markings for chapter and verse numbers). Here too, anyone who wants to help is welcome. Readers and contributers are invited to copy small or large portions of this online Tanakh, and to otherwise use it (and even help to improve it!) in any positive way that furthers the study of Torah. The project is hosted at Hebrew Wikisource (this experimental version is meant to eventually become the main Tanakh text at Wikisource). To begin using Miqra `al pi ha-Mesorah, please go to its main index (or here for the weekly Torah readings and here for the Prophets and Writings). 1. The first complete draft was finished on erev Shabbat Parashat Ki Teze, 10 Elul 5773; August 16, 2013. 2. The basic method for establishing textual details in this edition is similar to that of Mordechai Breuer and Miqra’ot Gedolot Haketer, both of which are extremely similar to each other: Despite the impression one can get from reading the literature about them, the differences between them are nearly insignificant compared to their similarities. Both of them largely conform to the original conclusions of Israel Yeivin regarding the reconstruction of the Aleppo Codex in its missing parts for niqqud and te`amim, and to the conclusions of Breuer himself for the letters. This new edition differs from both Breuer and MGH significantly more than they differ from each other. All of the editing has been done from scratch according to methodological details that are explained in the extensive introduction. The most visibly unique feature of this edition is in its formatting, which will be described briefly below. 3. An added indication of its practical purpose is the fact that the WLC omits basic elements of the Leningrad Codex when they are irrelevant to Christian translators and scholars, such as the division of the Torah into weekly readings, and of the Tanakh into sedarim. The parashah divisions (open and closed) are not represented visually, and the “song” formatting is not represented at all. These are all basic elements of the Leningrad Codex, and of the traditional Jewish division of the Tanakh for public reading, but they are not reproduced in the WLC. The chapter divisions are added instead. 4. Implementation is still in progress on this feature. 5. The new format for Sifrei Emet and the reasoning behind it are discussed in detail here. “מקרא על פי המסורה | Miqra `al pi ha-Mesorah: A New Experimental Edition of the Tanakh Online” is shared by Seth (Avi) Kadish with a Creative Commons Attribution-ShareAlike 4.0 International copyleft license. Please reciprocate for any adaptation or redistribution of this work by (1) properly attributing the work to Seth (Avi) Kadish, (2) clearly indicating the date you accessed the resource and whether any changes have been made (and if so, please be in touch with us and leave a comment below so that we might note your adaptation or improvement), (3) providing a link back to this source, and (4) specifying the Creative Commons Attribution-ShareAlike (CC BY-SA) 4.0 International copyleft license under which this work was shared. 2013-09-12 – 8 Tishri 5774 at 6:41 am · Reply. Just a question, as I am not an expert in copyright law: if I am transcribing a prayer from an old siddur and there are scriptural pieces in there, am I allowed to copy text from Mechon Mamre without specifying that I copied from them? * It’s the Bible, Mechon Mamre cannot copyright a text that is more than 2500 years old. 2013-09-19 – 16 Tishri 5774 at 11:36 am · Reply. 1. You can use parts of Mechon Mamre under fair use terms (like for small pieces of a siddur), but not more than that. 2. They cannot copyright a text that is thousands of years old. But they can copyright a text that they have edited according to their own personal criterion, and that is exactly what they have done. It is also what we have done at Wikisource, but unlike MM we have released it under an open license. To understand what “editorial criterion” mean in an edition of the Tanakh, read the introduction. 2013-10-24 – 20 Heshvan 5774 at 9:06 am · Reply. The version at that link will be corrected and updated appropriately as the project progresses. 2014-02-21 – 22 Adar I 5774 at 8:16 am · Reply. Thanks for all your work Seth. OpenScriptures now have an XML version which can be used by software developers (https://github.com/openscriptures/morphhb/tree/master/MAPM) so hopefully your work will be widely used. Could I make a plea for an English translation of your Introduction, for those goyim like myself who find Evrit difficult? 2014-02-22 – 22 Adar I 5774 at 10:33 am · Reply. I’ve long been under the impression that the area of biblical studies in which the biggest gap exists between Israeli scholarship and elsewhere, is precisely in the area of Masoretic scholarship. The gap is because of the language gap. In my personal opinion, the Israeli work in this area is both different and far beyond what goes on elsewhere, and most of it has never been translated. Regarding a translation, the full introduction isn’t complete yet even in Hebrew, so I couldn’t translate it yet even if I wanted to. Only chapters 1-2 are fully done, and I hope to finish 3-4 in the coming months. Even then I can honestly say that I won’t have the time or ability to translate it (it’s huge), but there is still light at the end of the tunnel: This is the true beauty of Open Content, namely that anyone can just go ahead and translate it themselves! I would be gratified if you or anyone else would publicize a call for volunteers to translate it as Open Content. Do note that the English and Hebrew Abstracts are basically identical. 2014-02-28 – 29 Adar I 5774 at 1:36 am · Reply. I added an English translation of the chapter titles in the Hebrew Introduction. Hope that helps at least a bit. 2014-03-01 – 29 Adar I 5774 at 10:42 am · Reply. Thanks for helping those of us behind the language barrier as much as possible. I appreciate that it is irksome to translate a subject which is natively Hebrew into English and those of us who are serious about this should increase our grasp of Evrit. 2015-05-20 – 3 Sivan 5775 at 1:31 pm · Reply. Seems like this could be programmed almost trivially, since the number of legarme not followed by revia or munah revia (e.g, Lev. 21:10) is very, very small, while conversely, the number of revia preceded by munah+paseq (easily mistaken for legarme) is exactly one (Isa. 42:5). But if I am wrong about this, someone please set me straight. I will be only grateful. 2015-05-20 – 3 Sivan 5775 at 6:15 pm · Reply. Hi Todd, what you write is generally true for the 21 books (though there are different rules for the 3 poetic books). The places where identification of legarmeih verses pasek is questionable are rare, but they do exist here and there (so complete automation is not possible, but it could still do the vast majority of the work). However, the implementation of the feature has since been completed (even for the 3 poetic books), so the point is now moot. Every legarmeih and pasek in the Tanakh has already been tagged, and the rare places that are uncertain already have special notes. 2016-07-19 – 14 Tammuz 5776 at 9:42 pm · Reply. 2019-01-28 – 23 Shevat 5779 at 5:40 pm · Reply. Would it be possible to double the necessary ta’amim (dechi, tzinnor) in the three poetic books as well? I have never seen it done, and I have long found that frustrating.